Wondering what princess-to-be Kate Middleton's wedding gown will look like? By the time most people read this, the Royal Wedding will be well underway; and soon we'll all know who designed the dress and how many yards of fabric--not to mention how many hours of stitching--went into its creation. 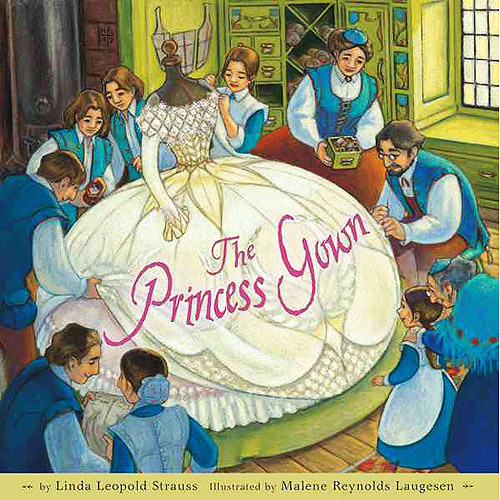 In honor of the day and the dress, I recommend The Princess Gown by Linda Leopold Strauss, illustrated by Malene Reynolds Laugesen (Houghton Mifflin, 2008). Strauss's own pedigree is perfect for this story: she is descended from a family of "Embroiderers to the Queen" who made, among other things, Queen Victoria's coronation robes. In The Princess Gown, Princess Annabel is to select her wedding gown from the offerings of all the tailors in the kingdom--but Hanna discovers a spot on the one her family has made! Quick thinking and nimble fingers save the day for the House of Abraham, and their gown's embroidered surprises--the princess's own pet squirrel and acorn among them--start a new fashion at court. I do wish the dresses were not all the same bell shape, though! Princess Annabel might want to pay attention tomorrow.